Within the past five years, the number of fatal motorcycle crashes in Jamaica skyrocketed, tripling since 2012. In a single year fatalities nearly doubled from roughly 58 per year in 2014 to 111 fatalities at the end of 2015. In January 2016, fatalities went up even more, with 15 deaths compared to 6 for the same period in the previous year. This growing epidemic has taken the lives of police officers, fathers, brothers, sons, grandfathers, mothers, daughters and sisters. Many died leaving children fatherless or motherless…some children being as young as two months old. To help combat this epidemic, ZBV developed the ‘Back to Basics’ programme (BTB), offered as a presentation at the Jamaica Driver & Traffic Expo for the past four years. Since September 2015, the material has been refined and tested as a one-day commercial workshop and delivered to test groups following a referral from the Jamaican Government’s Ministry of Transport Road Safety Unit. 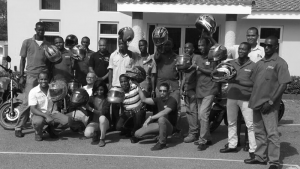 These workshops — designed specifically to help educate motorcyclists in the Caribbean context — have achieved 100% support from participants thus far, including the support of both experienced and novice riders alike. This course started out as a completely charitable effort and has evolved to become so much more. BTB now does training for riders in some of the largest commercial fleets in Jamaica – with motorcyclists doing over 400,000 stops or deliveries per year. In a unique funding model, BTB helps these company’s while doing outreach work that simultaneously helps rural innercity motorcyclists to stay alive – and boosts the national road safety efforts. Motorcyclists in the first group of Back to Basics Participants in September 2015.
the minds of 5000 motorcyclists in 2 years. Our plan is to save over 250 Jamaican lives over the next 3 years, and over 700 lives over the next decade. Knowledge, attitude and true understanding are critical. The material stands out for its heavy focus on risk-awareness, self-awareness and self-control as being more integral to survival on a motorcycle than traditional approaches to road code. 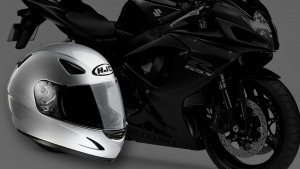 The custom-designed course combines extreme personal experiences and aviation-based safety risk awareness strategies as well as principles similar to courses from the Motorcycle Safety Foundation (USA) and Keith Code’s Twist of the Wrist rider safety series. ZBV delivers each workshop with hands on input from practical instructors like Jordan Mullings of Learn to Ride Jamaica. We also work very closely with Shango Bikerz and the Shango Racing team (including Jamaica’s 2015 B-Class racing champion), bringing more than enough real-world credibility in all these safety teachings. BTB has had excellent working relationships with Sandals Resorts International, Jamaica Constabulary Force, National Road Safety Council, the Road Safety Unit, Island Traffic Authority and the Insurance Association of Jamaica. If you would like more information or you would like to see the Back-to-Basics workshops delivered in your community or for your employees anywhere in the Caribbean, please feel free to contact ZBV. Motorcyclists interested in attending the workshop may sign up here.